Apple isn't slowing down with the new audio product releases, if a fresh rumor is to be believed: the company is being tipped to launch a truly wireless version of its Powerbeats earphones during the next month. Exactly what else we might get with the mooted upgrade isn't clear at the moment, but with the recent AirPods refresh in mind, some kind of wireless charging could be on the table. 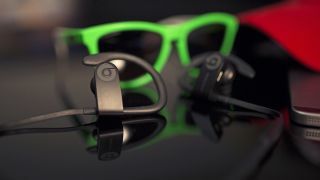 CNET's scoop comes courtesy of "a person close to the retail channel" who has given accurate tips before, so we can be fairly certain an upgrade is coming – it would be more of a surprise if Apple wasn't lining up a Powerbeats refresh. Might the same upgrades be coming to the Powerbeats 4? We'll have to wait and see, but an announcement is tipped for April, with pricing still to be determined. If the April date is right then we won't be hearing about the new Powerbeats earphones at the Apple event on Monday – instead Apple will spend all its time talking about its new video streaming service.